Check out these beautiful images from the Cassini probe's visit to Saturn. 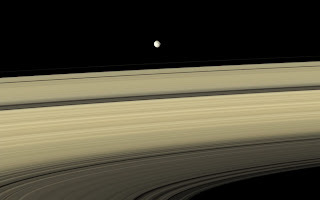 The one I included here shows the moon Mimas and a section of the planet's rings. Just getting that spacecraft out there and capturing these kinds of images is such a spectacular technological achievement for humanity. After the ugliness and misery and stupidity that I discussed in the previous post, seeing something like this once in a while really makes my day a whole lot nicer. Your website is very much interesting; I am your favorites. Also I follow your website. I have been maintaining this blog for more than a year. I have got many back links for my blog http://worldspacesatellites.blogspot.com/ from related sites. So if you could provide me a link to my blog, it will be much more useful for user and young school and college peoples. Around 10,500 visitors daily visits my blog. So it will be highly benefited for your sites also. It would be great pleasure if you can add this link http://worldspacesatellites.blogspot.com/ in your blog so that it can benefit our visitors. Please respond to me for this mail.